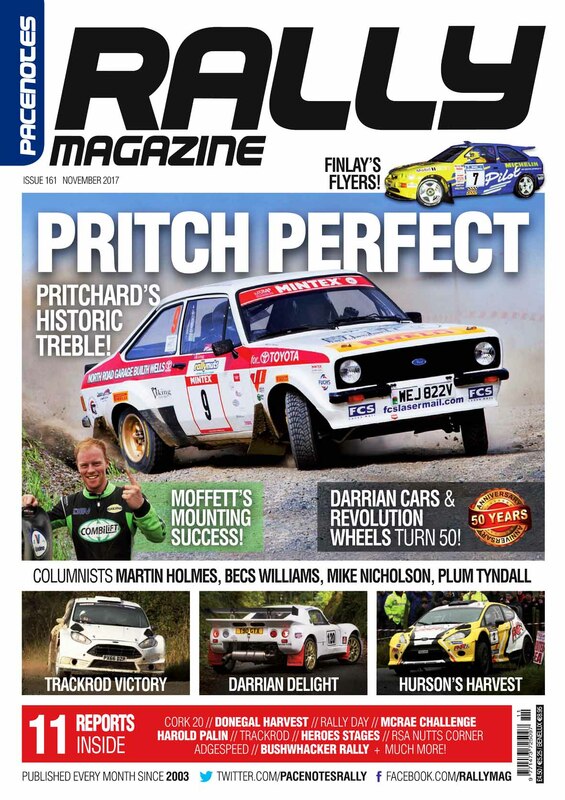 Jason Pritchard adorns the cover of the November edition of Pacenotes Rally Magazine after he became the first driver to win the British Historic Championship title three consecutive times. We put him 'In the Spotlight' and you can read all about how he clinched his third success at the final round. We also have a Darrian feature inside as the company celebrates 50 years. 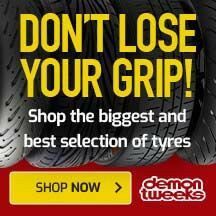 We visited their premises in Wales where we grabbed an opportunity to speak to the owners and delve into how Darrian has evolved since its inception, not to mention a closer look at the latest Darrian T90 GTR+. Revolution Wheels is another company that's celebrating 50 years in business and sticking with the '50' theme, Martin Holmes turns the clock back for a look at the 1967 RAC Rally and the reasons why it was cancelled. 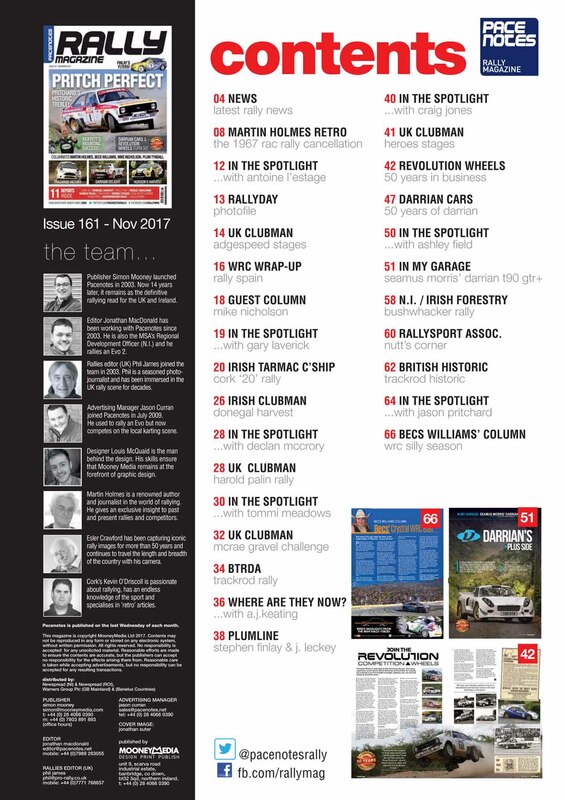 Becs Williams reveals her crystal ball and looks at the WRC 'silly season' while Mike Nicholson recalls the time he managed to get a stage cancelled and win a rally! Plum Tyndall delves into the archives and takes a brief look at the rallying exploits of both Stephen Finlay and James Cullen. Meanwhile, we have a whole host of other competitors who are 'In the Spotlight' this month. They include Antoine L'Estage, Gary Laverick, Declan McCrory, Tommi Meadows, Craig Jones and Ashley Field. 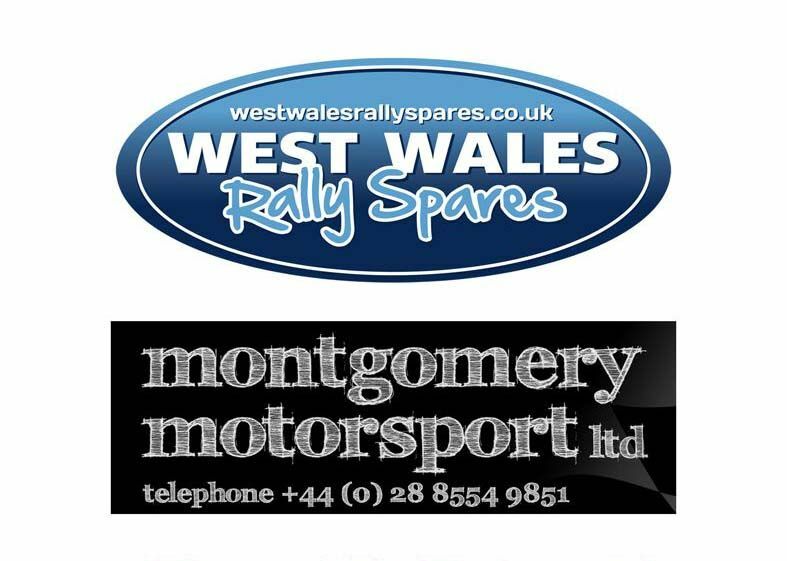 Plus there are lots of reports and photographs from the Cork 20, Donegal Harvest, McRae Challenge, Rally Day, Trackrod Rally, Bushwhacker Rally plus other clubman events such as the Harold Palin, Heroes Stages and Adgespeed Stages. Make sure you don't miss it! 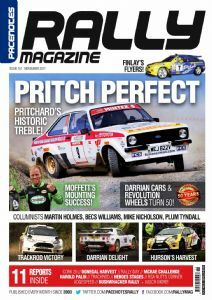 Order print and digital versions online at www.rallymag.com or call 028 4066 0390.